Produces 8-12" Visible Lightning-Like Discharges. Both the kit and assembled unit include an 8" toroid and wound coil (so you don't have to do any winding). Excellent Science Project. Fully adjustable. This is a spark driven Tesla coil generating highly visual and audible sparks into open air without a return contact. The unit operates from a standard 3-wire 115vac wall outlet requiring less than two amps. The transformer is current limited to 20 ma being well below the lethal value of 50 ma. 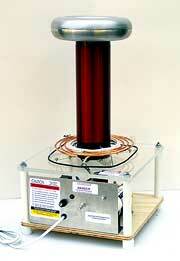 The tesla coil is easily tabletop operable and is a two-level assembly consisting of a top and bottom section. The top supports the vertical mounted secondary output coil and the flat Archimedean spiraled primary along with tunable clip lead. The bottom supports the transformer, capacitor and spark gap assembly attached by machine screws and nuts. A metal control panel is connected to earth ground along with the secondary return minimizing any dangerous shock hazards. The spark gap uses two pure tungsten electrodes rarely requiring cleaning or dressing. Hardware is all brass where required, with the primary coil being a hybrid between copper tubing and a heavy insulated wire. The kit version contains a pre-wound and fully prepped secondary coil and all parts to complete the unit, including an 8 x 2" toroidal terminal which greatly adds to the performance and overall appearance of the completed system. Hazards: 115vac line powered, requiring caution in assembling and testing. The output of the transformer (not the coil) can give a very painful shock and burn but is not considered lethal as short circuit current is only 20 ma. The output spark from the Tesla coil secondary can be painlessly contacted by firmly holding a metal object and drawing the spark to it. The Tesla coil must not be operated in a flammable atmosphere or near sensitive electronic equipment. Assembly: Mostly mechanical assembly with some soldering.